“Maritime Rose” is one of my most favourite Spode patterns. Manufactured from the mid-50s to the early 70s, its beautiful violet blue colour and hand painted roses make it very collectible. These pieces belonged to a lovely woman who liked to entertain and did so frequently, so this is all that’s left of her set of dishes, which came to me 20 years ago. The sugar bowl, creamer, water jug, tea cup, saucers and cake plates are all perfect. The teapot has a line crack and a chip at the end of the spout, the salad plate has a tiny flaw, and one of the butter pats has discolouration to the gold trim, but they are still pretty and perfectly useable. 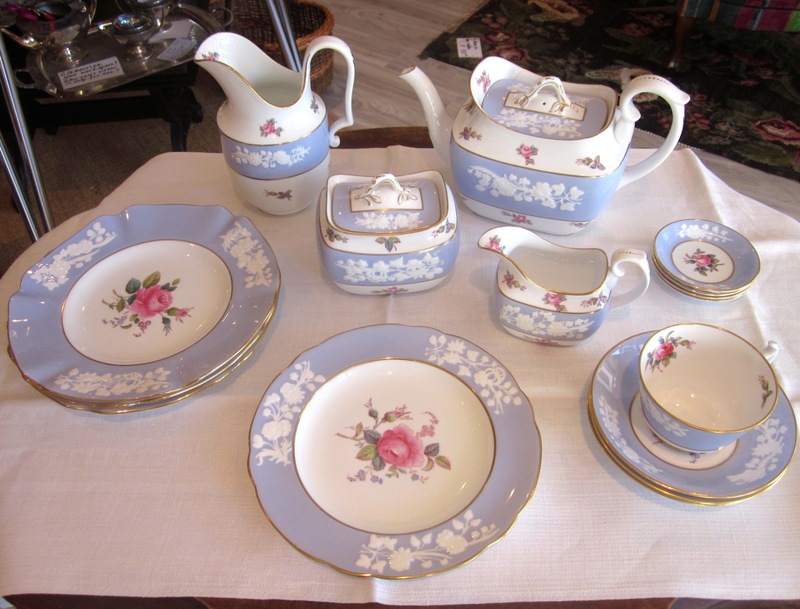 “Maritime Rose” pieces now fetch high prices on replacement china pattern sites. If you collect this, you know what I mean! Our prices are very reasonable.